The fashion industry has been abuzz with speculation as to the changes afoot at Paris Vogue with newly appointed editor-in-chief, Emanuelle Alt at the helm. In an interview with vogue.com, Alt revealed that "I want to keep the quality, the photographers we work with - David Sims, Mert and Marcus, Mario Testino and Bruce Weber. I don't think there should be radical changes. The magazine should still be chic and sophisticated." It is no surprise then that Alt's first three issues of Paris Vogue have all the regular staple photographers driving her vision for the publication. 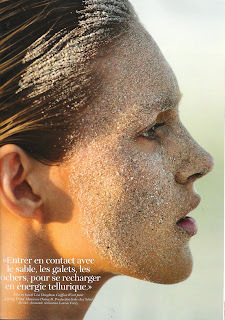 I was about to stifle a yawn, when I turned a page and saw a name that I had not seen in print in Paris Vogue for years, Hans Feurer. 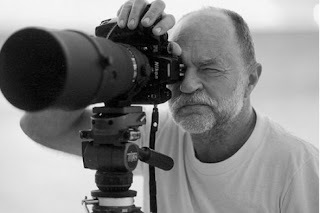 Swiss-born Feurer, was a renowned fashion photographer in the 70s and 80s, whose name was synonymous with publications such as British Vogue, Vogue Paris, US Vogue, Marie Claire and French Elle. I have been a long-standing admirer of Feurer's work which is clearly distinguishable by his use of long lenses, blurred back grounds and grainy film aspect with the subject in sharp focus. Much of Feurer's work is shot in outdoor location settings with the model in motion, taking maximum effect of the natural light and environment. Feurer has captured many of the world's most recognisable models on film. When quizzed in an interview for Paris Vogue as to who he would most like to photograph, Feurer rhapsodises "I had the chance to work with the most beautiful women in the world from Pat Cleveland, Christy Turlington to Stephanie Seymour... Kate Moss is the only one that I haven't photographed." Feurer is definitely back in the game having contributed most recently to i-D Magazine, Vogue China and Numero. I have a feeling the best is yet to come from Feurer and am hedging bets on Alt playing an instrumental role in combining the creative talents of Moss and Feurer.